The evening we got the tyres, 4th March 2006, we went back to the river bottoms at West Terre Haute and I managed to break something on the car. What happened was that I drove the car into a set of ruts and high-centred the car. This means that frame of the car is grounded on a high bit if ground and the wheels just spin. Unfortunately, whilst using the forward and reverse gears to try and bump the car out of the ruts something went bang somewhere and the front of the car started making a horrible hammering noise. Andy's GMC K3500 Diesel truck pulled the car out of the ruts and whilst following him out of the area he spun the tyres causing mud to fly over The Ho's windscreen. 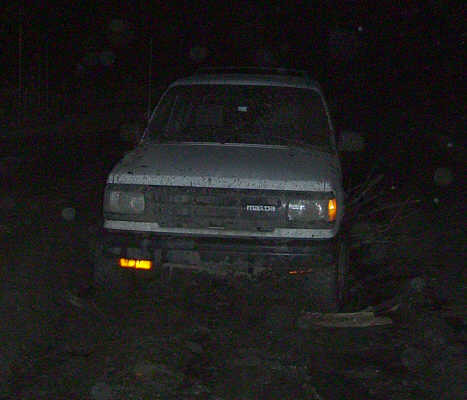 Unable to see, I ran the car into a water filled ditch. After being pulled out again we found the chain hook couldn't be pulled free of where I'd attached it on the chassis. I originally put that Andy drove an F150, I don't know why I did that, Andy doesn't like Fords at all. I think the Mazda Navajo, almost identical to the Ford Explorer, is the closest he's got to owning one. I was able to drive "The Ho" home in two wheel drive with one end of the chain still attached to the frame, the rest of it ran over the hood, through the passenger window and piled up on the floor. Out of the possibilities, I've broken a union joint, hub or the front differential. The day after our trip to the river bottoms other off-roaders were there and were asked to leave by the DNR (Department of Natural Resources). It appears that a lawyer has bought the land and has plans to turn it into a dammed basin and to build a floating casino there. 5th March 2006 - We took the front hubs off and found why they failed the previous evening. There's a sliding splined sleeve inside the hub that's supposed to be engaged when in 4 wheel drive. From the condition of it, it seems that it wasn't being engaged properly and the ring they are supposed to engage just slipped under heavy load, making that nasty hammering noise we heard last night. 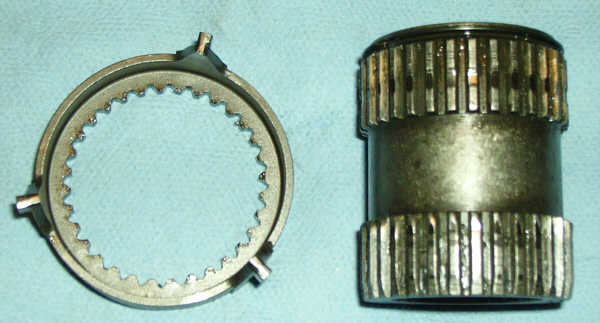 The ring, top left, is supposed to engage in the splined sleeve. The splines are worn and it looks like the ring jumped the splines under heavy load. 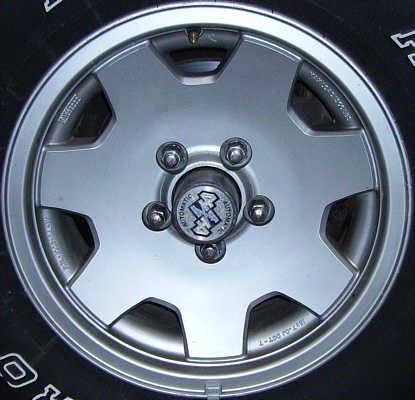 Automatic hubs aren't always as reliable as manual ones and the Mazda Navajo / Ford Explorer hubs have a problem where if too much grease is packed into them then they don't always engage properly. 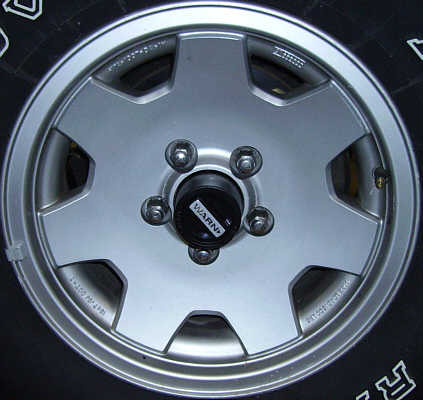 Our hubs didn't appear to be to have a lot of grease and to be on the safe side we ordered Warn manual hubs, part number 29071, model number M250D from someone on eBay for $70. We also had to buy the Warn spindle nut conversion kit, part number 27997, also on eBay for around $50, both prices include delivery. A bit better than the $200+ some places want for the hubs and conversion kits. A couple of taps with a big hammer and a crow bar managed to free the chain hook from the frame. 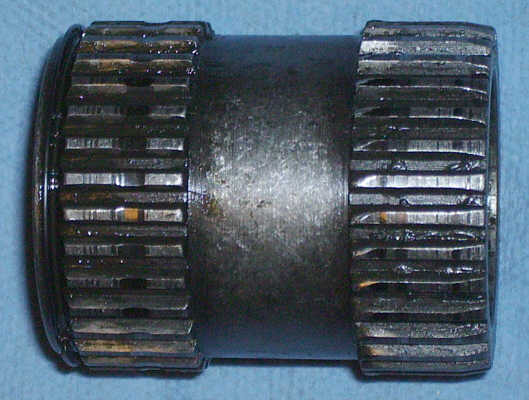 The hubs and spindle nuts were replaced on 15th March 2006. The old hubs were taken off and everything attached to the shaft inside removed. The new spindle nuts were added and only the old grooved ring and circlip, to stop the shaft from retracting, were put back on. The new manual hubs do mean that to change from free-wheeling to locked and back we have to get out of the car and do this manually but we think it's worth it in terms of better traction. As a side note, this does not affect the operation of 4x4 high and low dashboard buttons.